1980 Madame Arkadina in Anton Chekhov's The Seagull, Globe Theatre, Regina. Director: Brian Way. 1980 Marjorie in Just Between Ourselves by Alan Ayckbourn, Summer Theatre White Rock. Director: Pat Armstrong. 1980 Nellie, Daniel, Emma and Ben, television, Canadian Broadcasting Corporation. 1980 Broadcast of a radio play, Yes or How do you convince an Israeli? on CBC's The Hornby Collection by Jana Veverka. Written by Joy Coghill in the mid 1970's, this play was translated into Hebrew by Shimon Levy and produced for Israeli radio in the late 1970's. In 2005, Yes was subsequently published in Israel in An Anthology of Canadian Plays in Hebrew edited by Prof. Shimon Levy. 1981 MA!, by Eric Nichol, New Play Centre, Vancouver. Director: Pamela Hawthorn. It had a Kamloops Theatre premiere and a tour through Alberta and B.C. The production was also at the Waterfront Theatre, Vancouver and was filmed as a CBC Television special (1983). Director Phil Keatley. 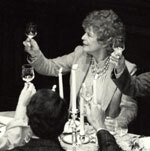 1981 Sarah Bernhardt in John Murrell's Memoir, Alberta Theatre Projects, Calgary. 1982 The Dining Room by A.R. Gurney, Belfry Theatre, Victoria. Director: James Roy. 1982 Title role in Sister Mary Ignatius Explains It All To You by Christopher Durang, Lunchbox Theatre, Calgary. Director: Ken Dyba. 1983 Linda Loman in Death of a Salesman, by Arthur Miller, Playhouse Theatre, Vancouver. Director: Walter Learning. 1983 Lead in Change of Heart, directed by Anne Wheeler, National Film Board and the Canadian Broadcasting Corporation. 1983 Harriet in The Sun Runner, by Ken Dyba, Toronto Free Theatre. Director: Guy Sprung. 1983 Margaret in Richard III, Globe Theatre, Regina. Director: Brian Way. 1984 Narrator of documentary Japanese Woman. Director: Kalle Lasn. 1984 Lidya Vasilyevna in Do You Turn Somersaults?, by Aleksei Arbuzov, Alberta Theatre Projects, Calgary. Director: Douglas Riske. 1985 Baba in Tsymbaly by Ted Galay, New Play Society, Vancouver. Director: Jane Heyman. 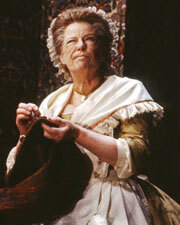 1985 Mrs. Hardcastle in Oliver Goldsmith's She Stoops to Conquer, Avon Theatre, Stratford Festival, Ontario. Director: David Williams. 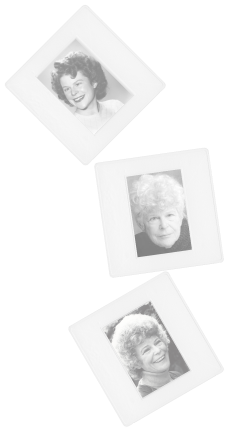 1985 Plays Albertine at 60 in Michel Tremblay's Albertine in Five Times, Tarragon Theatre, Toronto. Translation: John Van Burek and Bill Glassco. Director: Bill Glassco. 1986 Receives the YWCA Women of Distinction Award in arts and culture. 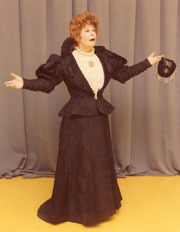 1986 Edna in Betty Lambert's Jennie's Story, National Arts Centre, Ottawa. Director: Bill Glassco. 1986 Movie Nobody's Child, Gaylord Productions Inc. Director: Lee Grant. 1986 Red Serge, episode called Apron Strings, CBC Film Series. Directors: Myrna Cobb and John Holdstedt. 1987 Charlotte in TV Movie Christmas Comes to Willow Creek. Director: Richard Lang. 1987 Dede Wilkins in movie Blue Monkey aka Green Monkey aka Insect (USA: video title) aka Invasion of the Bodysuckers (UK: video title). Director: William Fruet. 1987 Airwolf, Season 1, episode 15, Flowers of the Mountains, Atlantis Skyline Productions Inc. Directors: Patrick Corbett and J. Barry Herron. 1987 Frieda in Song of This Place, by Joy Coghill, Vancouver East Cultural Centre following a tour of the Queen Charlotte Islands. Directors: Robert More and Roderick Menzies. 1988 Elizabeth in My Memories of You, by Wendy Lill, Prairie Theatre Exchange, Winnipeg, Manitoba. Director: Kim McCaw. 1988 Marthe in Summer by Edward Bond, Canadian Stage Company, Toronto. Director: Neil Munro. 1989 Rebecca Nurse in Arthur Miller's The Crucible, Citadel Theatre, Calgary. Director: Robin Phillips. 1989 Mistress Quince in Shakespeare's A Midsummer's Night Dream, Citadel Theatre. Director: Robin Phillips. 1989 Dual Solitudes, an Israeli anthology of poetry, both Arab and Jewish. This was a joint reading by Joy Coghill and Dr. Shimon Levy, a director and head of the Theatre Department of the University of Tel Aviv. They appeared in Montreal, Edmonton, Vancouver and Victoria.